I hope you had a great Thanksgiving. I'm certainly thankful for my Aussie, Levi, the Australian Shepherd community I've met through the website and our Facebook page, and you—our newsletter subscribers! Our new articles this month cover a lot of ground including the important topic of socialization which, if done well, will help you avoid having fear aggression develop in your Aussie (which we cover in another article). We also take a closer look at depression in dogs. Find out more about this condition, the symptoms to look out for, and what you can do to help your dog get through the blues. 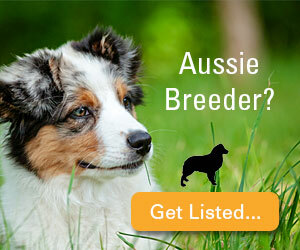 Plus, there are training and health related articles including one about allowing your dog in bed. Some people love it, others hate it. We take a look at some of the pros and cons. IBS in dogs can be a complicated subject, as it is possible for dogs to develop a number of bowel related issues. Having a dog in bed is something that many owners choose to do, but this behavior is not without its controversy. Dog socialization is a very important part of training and is vital to a well-behaved, calm, and even-tempered dog. Fear aggression in dogs is often misunderstood but it is more common than you might think and can be very dangerous. Depression in dogs may seem like an unusual idea, but it's a very real concern and more common than you might think. 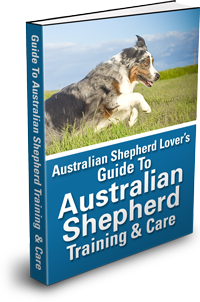 How to train my dog is something that most owners are very interested in. Nobody likes having a wild or unruly dog. 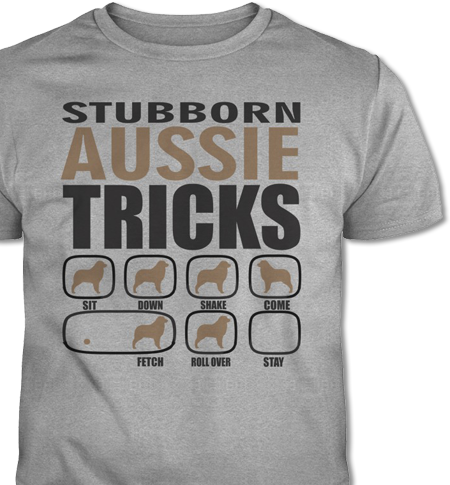 Preshrunk Cotton Aussie T-Shirt - Guys/Ladies Tee, Sweatshirt, Hoodie and Longsleeve Styles Available.